The foundation of Lowry Research analysis is the law of supply and demand, a concept that governs market trends whether analyzed from a technical or fundamental basis. In order to measure the forces of supply and demand, Lowry compiles daily market metrics, including up/down volume and points gained/points lost, for all issues traded on the New York Stock Exchange. These statistics inform Lowry’s proprietary measures of the intermediate-term trends of investor supply and demand: Buying Power and Selling Pressure. Lowry has been able to study the actions of buyers versus sellers during the formation of every major market top over the past 80-plus years. The findings show that the intermediate-term trend of supply, as measured by Selling Pressure, shows a persistent increase heading into a bull market high for major indexes. This rise in Selling Pressure reflects the increased selling that takes place during the final months of a primary uptrend as investors increase profit-taking, perceiving stocks as overvalued. Supply eventually overtakes the force of demand, as measured by Buying Power, with declining prices as the end result. This concept accurately depicts how every bull market throughout history has reached its terminus. The study of supply versus demand is a critical part of portfolio management, helping investors to avoid the devastating losses resulting from bear markets. To illustrate the consistent behavior of the forces of supply and demand at major market tops, it is instructive to look at the action of Selling Pressure heading into two significant market tops: 1929 and 2007. In 1929, the trend of supply, as measured by Selling Pressure, began a sustained rise in August 1928 through May 1929, even while the Dow Jones Industrial Average experienced a gain over the same period of roughly 36%. Selling Pressure then contracted briefly prior to the Sept. 3, 1929, market high, but began a sharp rise until just before the final market top on Oct. 29, 1929. There was ample warning that sellers, or the force of investor supply, were growing increasingly active, even though market prices were rising. 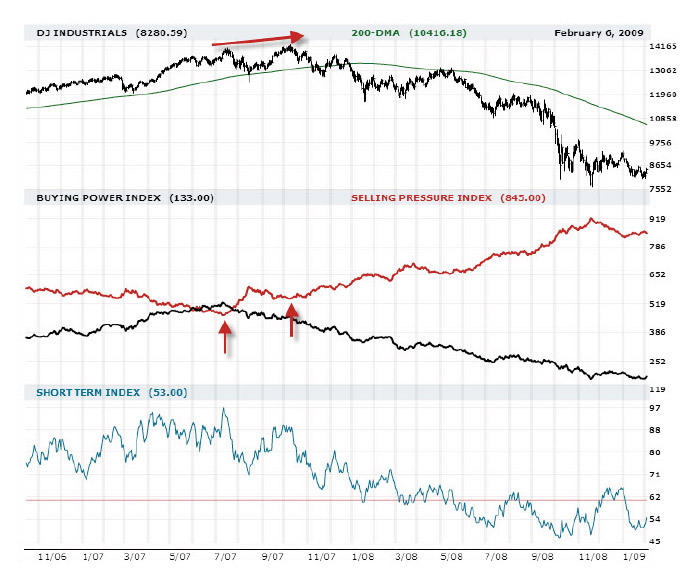 Selling Pressure also offered a clear warning of a major market top in 2007. After a year-long decline, the index bottomed simultaneously with the July 2007 market high. But, by the time of the October 2007 market top and higher high, Selling Pressure was well above its July low, suggesting a significant increase in supply. This October high was then followed by the 2008 plunge in the market. The increasing dominance of the force of supply during the formation of the major market tops in 1929 and 2007 provided an accurate warning that the U.S. equity market was undergoing a fundamental shift—a transition from a primary uptrend to a primary downtrend. Recognizing when a transition is taking place enables investors to adjust portfolios accordingly by, ideally, using periods of rallies to lighten exposure to equities and build a more defensive position. Such a strategy will help ensure that the majority of profits reaped during primary uptrends are preserved, rather than destroyed, during periodic and inevitable bear market cycles. This article first published in Proactive Advisor Magazine on May 7, 2015, Volume 6, Issue 6. Lowry Research Corporation was founded in 1938 to provide analysts and investment professionals with an unbiased, factual analysis of the stock market. Its work is based on daily price change/volume statistics of all stocks traded on the New York Stock Exchange and NASDAQ Stock Market. This provides the statistical foundation for a supply-versus-demand analysis of market trends. For more information on Lowry Research, please visit lowryresearch.com.